Next Schools and the Procrustean Bed: are we really ‘personalising’ learning? I would say the absolute base has got to be that it allows for users (espec. 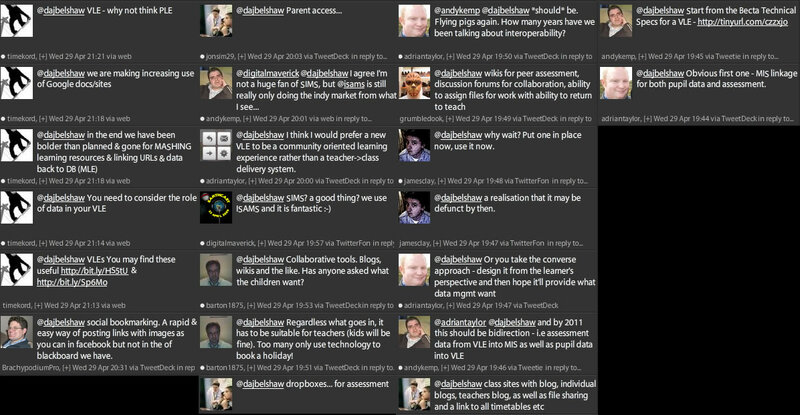 staff) to easily produce and publish content for learners even if they have no confidence in their IT skills. It should also allow for publishing of both public and private content as appropriate with ‘course’ or other structures to allow for granularity in privileges and access. There is lots to discuss in this post. In fact maybe too much. 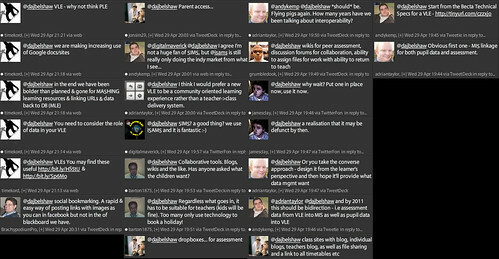 Might make an excellent basis for a discussion at http://edtechroundup.com. One of the things that strikes me is the publishing of pupil work to the world. A must to open up different audiences to our learners; that is a significant factor for pushing online work in classrooms. So, that said, how do we protect their identity? Should we? Or should we protect them from unwanted interest and teach them to keep specific details (e.g. email address) secret outside the school community? At the moment, I am also thinking that VLEs should not be a file repository (no surprise there, but this is the easy self-explanatory hook for new teachers) but then the question is what do you mean by *clearly structured course elements*? What is your ideal? What would you like to see happening across the academy in 2015? Teachers (all?) using the VLE to present various learning opportunities: aggregating tools, learning progress and outcomes. My thoughts on this (the ideal) to apply to my current model is that every unit of work delivered in my school would have a master template course on the VLE. That means a teacher would accept that, for any unit on our school curriculum, there must be a course to contain a bank of resources for teaching and learning (lesson plans, IWB pages, links, suggested forums, suggested assignments and much more). This would form the starting point for any learning unit. Any teacher would be free to use it as they deemed appropriate, but also be able to add/remove items for their class. The tools may be dictated by the individual teacher and possibly the pupils; add wikis, assignments, forums, workshops etc. to generate the dynamic learning process. All this is possible on Moodle and, I imagine, many other LPs. The problem is defining your expectations and then making it part of the Headteachers expectations of his/her teaching staff. Maybe it is necessary to forge that vision together, as a whole staff body. Ambitious but possible. You might have the opportunity to do that over two academic years. Thanks for sharing the ‘nuts and bolts’ of E-Learning. Its’ really helpful for a learner.